# # Note: A blank file c:\scripts\encrypted_password.txt must be created first! $volumes = "REMOTEDAG_TL01", "REMOTEDAG_TL02", "REMOTEDAG_TL03"
echo "Connecting ... this can take a few minutes!" 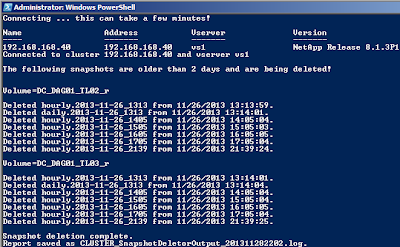 echo "Connected to cluster $cluster and vserver $vserver" ""
# but -Append is not available Powershell pre-3.0. # NOTE: If you hash the next line this script just does reporting! echo "Deleted $snapshotName from $snapshotDate. " echo "$snapshotName from $snapshotDate @@@@@ WAS NOT DELETED!" } # END of "foreach ($snapshot in $snapshots)"
} # END of "if ($snapshots)"
echo "Volume $volume has no snapshots older than $daysWorth days!" } # END of "foreach ($volume in $volumes)"
echo "" "Snapshot deletion complete." "Report saved as $filename." 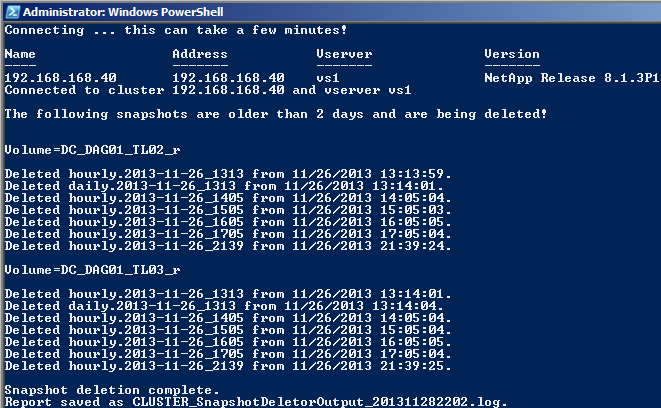 Image: Example of SnapDeletor running on a LAB VSIM and deleting snapshots older than 2 days!